A Well-Fed World | Animal Agriculture's Impact on Climate: Do Percentages Matter? Animal Agriculture’s Impact on Climate – Do Percentages Matter? Like me, you might be accustomed to seeing percentage figures on posters and elsewhere, indicating livestock’s share of greenhouse gas emissions. Here’s an image showing a poster from the People’s Climate March in New York in September, 2014. I’m not keen on quoting figures indicating livestock’s climate change impacts, unless I can try to explain them. Posters are not a great way to do that. One problem is that, while environmental processes are dynamic, the figures are often portrayed as if they’re set in stone. Another problem is that the figures depend on whichever factors have been taken into account, which can vary significantly from one report to another. I commented on that issue in my February, 2013 article “Omissions of Emissions: A Critical Climate Change Issue“. I stated that critical under-reporting of livestock’s impact occurs in many “official” figures because relevant factors are omitted entirely, classified under non-livestock headings, or considered but with conservative calculations. An example of the latter is methane’s impact based on a 100-year, rather than 20-year, “global warming potential” (GWP). Methane is many times more potent than carbon dioxide as a greenhouse gas, and more so over a 20 year time horizon than 100 years. More on that below. So while figures are often portrayed as being absolute, they should ideally be qualified so as to explain how they have been arrived at. That might not be very practical, but the issues are complex and cannot always be conveyed appropriately with just a few words or numbers. Despite the amended approach, both the 2006 and 2013 reports included emissions from fertiliser and feed production, land clearing, manure management, enteric fermentation (producing methane in the animal’s digestive system) and transportation of livestock animals and their feed. Both were based on the conservative 100-year GWP for methane. 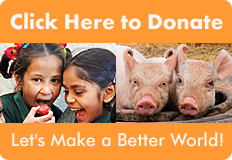 The suggestion that livestock are responsible for at least 51 percent of the world’s greenhouse gas emissions came from a 2009 World Watch magazine article by Robert Goodland and Jeff Anhang. Goodland was the lead environmental adviser to the World Bank, and Anhang is a research officer and environmental specialist at the World Bank’s International Finance Corporation. The article was effectively a critique of “Livestock’s Long Shadow”, with amended figures reflecting the authors’ concerns over the report. The authors took into account various factors, including: livestock respiration; 20-year GWP for livestock-related methane; and some allowance for foregone carbon sequestration on land previously cleared. Some have argued against the inclusion of respiration. 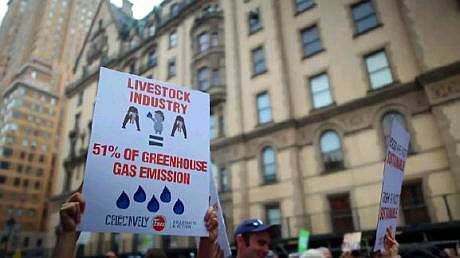 Based on my calculations, by excluding that factor, the analysis would have indicated that livestock’s emissions represented 43 percent of the global total. Goodland and Anhang applied a 20-year GWP to livestock-related methane emissions, which is particularly relevant to: (a) potential near-term climate change tipping points; and (b) identification of relatively rapid mitigation measures. Methane breaks down in the atmosphere relatively quickly, with little remaining after 20 years. As a result, a 100-year GWP greatly understates its shorter-term impact. Even methane’s near-term impacts can become long-term and irreversible to the extent that they contribute to us reaching tipping points and runaway climate change. Goodland has argued that the impact of such an approach would have been more than offset by the fact that the number of livestock animals they based their assessments on (being the number used in “Livestock’s Long Shadow”) was far below the figure of 56 billion that the FAO’s statistical division had reported in 2007. He and Anhang became aware of the higher figure after their article was published. With the rapid increase in extraction of unconventional fossil fuels since 2005, the growth in other anthropogenic sources of methane may have caused livestock’s share of emissions to reduce from what it would otherwise have been. The FAO allowed for emissions from land clearing in the year such changes occurred, with loss of carbon from vegetation and soil. However, it did not allow for the resultant ongoing loss of carbon sequestration. Goodland and Anhang sought to allow for that factor to some extent. They suggested the possibility of allowing land that has been cleared for livestock grazing or feed crop production to regenerate as forest, thereby mitigating “as much as half (or even more) of anthropogenic GHGs” [greenhouse gases]. They argued that the land could, alternatively, be used to grow crops for direct human consumption or crops that could be converted to biofuels, thereby reducing our reliance on coal. They used the biofuel scenario in their calculations, incorporating the greenhouse gas emissions from the coal that is continuing to be used in lieu of the biofuels. Goodland’s response to feedback to the 2009 World Watch article can be seen in his March/April, 2010 article, “‘Livestock and Climate Change’: Critical Comments and Responses“ (referred to above). Estimates of animal agriculture’s share of Australian emissions range from the official figure of around 10 percent to 49 percent. The overall figure for animal agriculture may actually be higher than 49 percent using BZE’s calculations, as they have reported it solely in relation to rangeland grazing. However, their figure for all agriculture is only marginally higher, at 54 percent. Here’s my contribution to the world of posters, which I like to believe accurately represents our current position. 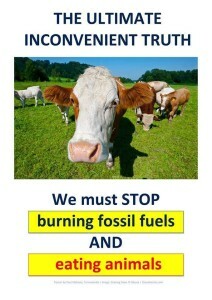 Regardless of which approach is adopted, the key message must be that we will not overcome climate change without urgent action on both fossil fuels and animal agriculture. The precise percentage share of the many contributors to greenhouse gas emissions matters little in that context. The FAO is now indicating that meat consumption will increase by more than 70 percent by 2050, and has suggested various approaches for reducing relevant emissions. However, any improvement in the emissions intensity of production would be marginal relative to the reductions that could be achieved by a general move toward plant-based products. Goodland, R., “‘Livestock and Climate Change’: Critical Comments and Responses”, World Watch, Mar/Apr, 2010. 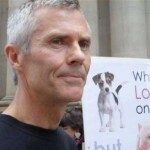 Paul Mahony is an environmental and animal rights activist, researcher and author who is trying to remove what he considers to be blinkers and blindspots in the community resulting from social, cultural and commercial conditioning. He lives in Australia. Learn more at his blog, Terrastendo. © 2009-2019 | Contact Us .